World Homelessness Day offers an opportunity to reflect on what constitutes homelessness, to think how society should respond and consider who the homeless are. The focus is understandably on the here and now. But should we not also acknowledge that homelessness has been a long-term historical problem. Despite the campaigning efforts of Shelter and Crisis, over the last fifty years, there remains a tendency for the public to associate homelessness with rough sleeping not least because of its visibility, and it conflicts people. Opinion surveys frequently show at least a third of respondents attributing fault to the homeless presuming they made bad life choices. The undeserving homeless notion has a long lineage. The Victorians saw those of no fixed abode as vagabonds and tramps: invariably male, workshy, content to live of charity and criminality. They were feared because their mobile lifestyle rejected the trinity of work, respectability and religion. The authorities response was deterrence using the 1824 Vagrancy Act to curb their anti-social behaviours and tightening the rules regarding use of the Workhouse Casual Wards introducing work duties in 1871 and two nights detention in 1882. The problem was that little was known about who the tramps were and what drove them to take to the road. Without this insight how could a society address such a challenge? The wandering, unskilled tramp labourer from the 1870s replaced tramping artisans. Societal upheavals due to population growth, industrialisation, and urbanisation it was presumed swelled the numbers of vagrants. The poor were trapped in a sliding scale rental market and when they reached the bottom it was either the Workhouse or the road. Structural reasons may explain some of the problem, though in themselves are not adequate explanations. By reconstructing the life-stories of tramps, using genealogical methods, it becomes evident an “undeserving” lifestyle explanation is inadequate. Rather many experienced, what would be termed today, “complex trauma” (ill health, both physical and mental, disability, addictions and relationship breakdowns). They were not workshy. Rather many were incapable of anything more than short-term menial work. Consider the gentleman above. 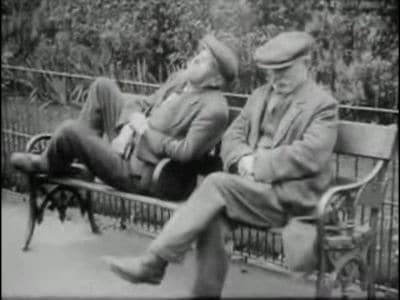 He was, alongside his elder brother, a habitual tramp circulating around the East Midlands from the 1880s until the 1920s. Apprenticed to a blacksmith, he tried to join the army but was rejected as “ineffective” before taking to the road. Two lengthy penal sentences for rick-burning were served in between three periods in an asylum. As a child he had witnessed his father’s suicide and went into the workhouse. He evidently had learning difficulties and when institutionalised was prone to be “noisy” or “refractory” or engage in self-harming behaviours. The orphaning and growing up in the workhouse would have had immeasurable impact, and at this point society had only a rudimentary understanding of mental health problems. The themes highlighted above persisted through into the 20th Century. The State thought the tramp was a dying phenomenon, an optimism that was used to justify the closure of the Casual Wards in 1948 and their replacement with a smaller network of Reception Centres. Unfortunately, time showed that not much had changed. An influential 1966 report concluded the single homeless was male, over 40, and someone who had experienced relationship breakdowns, lost touch with family and suffered from intermittent employment. A Department of Environment report in 1981 concluded that the single homeless suffered disproportionately a fateful combination of disability, mental illness, unemployment and debt. The modern homelessness sector has tried to prick the moral conscience of the public using vivid individual examples to humanise the experience of homelessness. The problem is that too often the public are unable to connect these cases to wider structural responses that might assist in alleviating matters. This is where history can contribute by telling these individual stories of the tramp within the context of the economic, social, and political circumstances that shaped people’s experience of homelessness.